Introduction to the four issues. 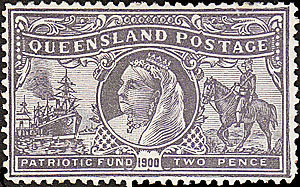 From 1897, three of the Australian Colonies began to issue postage stamps with a radically different purpose. The stamps were still intended to pay for the costs involved in posting a letter but they also raised money which was given to a designated Charity. 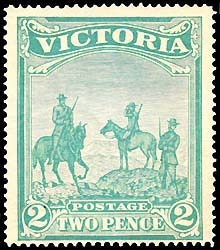 Stamps with such a double purpose are referred to as being semi-postal stamps. 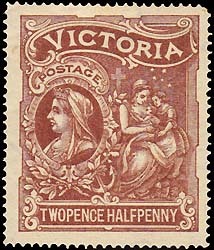 The cost of this type of stamp was therefore more than the normal postage cost. The difference between the purchase cost and the postal rate was the amount donated to the philanthropic cause supported by the issue. 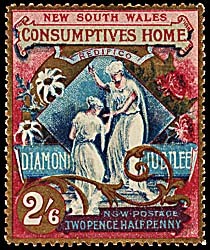 New South Wales was the first postal authority in the world to issue such stamps - in June 1897. 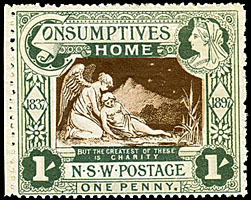 The were issued to raise funds for the NSW Consumptive Homes. 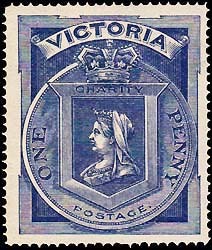 Victoria followed the example set by NSW and issued its set of two Hospital Fund Charity stamps in October 1897. 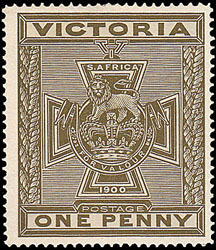 Victoria issued a second set of two Charity stamps in 1900 - to raise funds for the Patriotic Fund supporting soldiers in the Boer War. 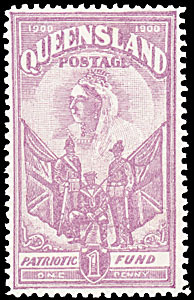 Queensland also issued a set of two Charity stamps in 1900 - also to support the Patriotic fund. This web-site reviews the four issues of the Charity stamps issued by the three Colonial postal administrations. There has been no similar issue by Australia since. Many countries have however followed the lead and have issued their semi-postal Charity stamps - especially Switzerland. All the information can be obtained by using the drop-down menus at the top of each page as well from the site maps at the bottom. To return to a previously viewed page, use the "Go Back" button in the top left corner of your browser. Comments and suggestions are welcomed. Please contact me at apta@ozemail.com.au. Last revision: 3 September 2015.